Friends and family know that when I go to Olive Garden I always order the exact same thing: the minestrone soup and the fettuccine alfredo. Why? Because they are both delicious and, until now, I couldn't duplicate them at home! 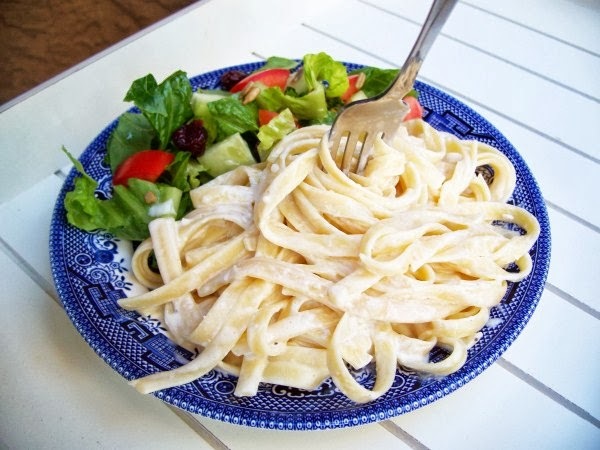 Lucky for me I discovered a copycat recipe for the fettuccine alfredo online that, for me, is close enough to the real thing that I haven't been to Olive Garden in over a year. And it's easy! Of course the recipe calls for heavy cream - that's why it's so delicious! However, I have discovered a way to cut a little fat and not lose out on the thick and creamy texture of the sauce. I mix fat-free half-&-half with a little cornstarch to replace the heavy cream. It works! If you have a husband like mine who doesn't consider "plain" pasta to be a "real" meal, add some sliced, grilled chicken or sauteed shrimp to round it out. While pasta is cooking, melt butter in a saucepan over med-low heat. Add garlic and cream or half-&-half mixture and bring to a simmer. Whisk in cheese and simmer for 8 minutes, stirring occasionally - do not boil or sauce will separate! Add salt and pepper, to taste. Drain pasta and toss with sauce. Serve with a sprinkle of Parmesan.